This tutorial will guide you step-by-step into some features of iris_xfiles and CRISPEX. In the middle panel, next to Search Directory: press Change. Then navigate to the directory ~/data_temp/iris/20131226_171752_3840007146, press OK when this directory is selected. Notice that Search Pattern changed to free search. Make sure the time of these observations (2013 December 26, 17:17 UT) is contained in between the Start Time and Stop Time range, adjust if necessary. Now press Start Search, and on the middle panel you will see a row with a summary of the observations, and a list of files on the bottom panel. If you double click on the slit-jaw files, you can see a movie with Ximovie. 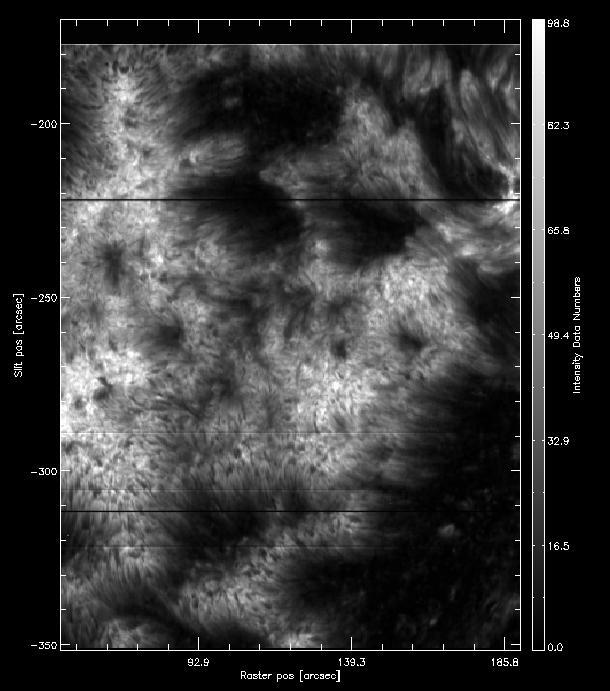 In this case the observations are a 400-step raster of an active region. 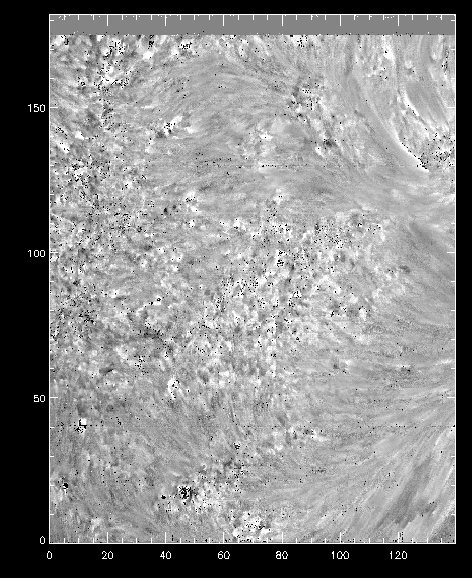 Because the slit-jaw images have been aligned to fixed coordinates on the Sun, the images are moving from left to right and black bars appear in the regions which are not exposed (the images are enlarged to fit the maximum extent of the observing sequence). With Ximovie you can adjust the display limits and also apply a gamma to the images. If you double click on the raster file, an iris_xcontrol window will appear. 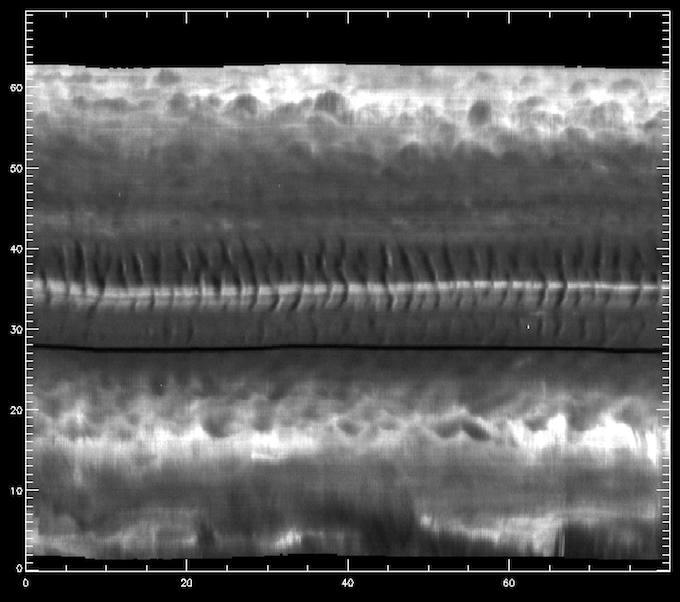 This has a lot of information about the particular observing sequence, and displays some sample spectra and slit-jaw images. The middle spectral panel is split in the NUV (green-white) and FUV (red-white) spectrograms. 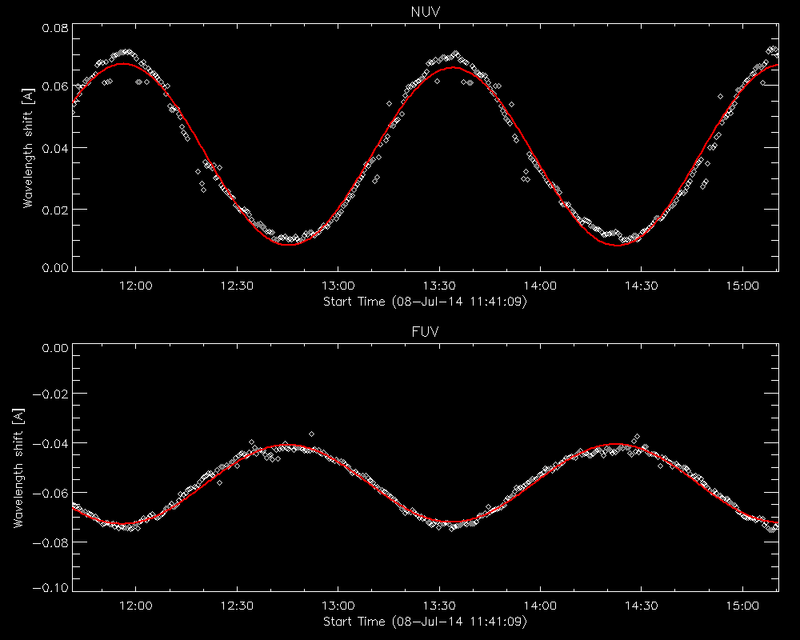 You can also identify which spectral regions were observed. Clicking on either spectrogram will let you inspect individual spectrograms for all the steps in the sequence. You can also do the same with the SJI images. Now we’ll use the profile moments tool. On the top left panel select the Mg II k 2796 line and under Line fit select Profile Moments. On the Moments Prep Tool window adjust the reference wavelength so that it matches the k3 core, and set the line start and stop so that it is about 5 pixels wide around k3. Set the continuum to be about 5 pixels wide on the right side of the plot, in a region with no absorption line, like the figure below. How the wavelength selection iris_xfiles moment tool should look like. Press Finished. It will take a while to calculate the moments statistics in the region defined, and a new window opens. The result for intensity should look like the figure below. How the intensity from the k3 first moment should look like. This looks very much like the Mg II k3 intensity, because we selected a very narrow window around it. On the bottom left side of the iris_xmap window you can also change Select data to show the first moment (centroid) velocity, but in this case this is not so reliable because we chose a small wavelength window. Now to the same in Profile moments but select the k2v feature instead of k3. The result for intensity should look like the image below. How the intensity from the k2v first moment should look like. You can also experiment with the many other options of iris_xfiles as a quick way to explore the data. Now we are going to create level 3 files from this set to use with CRISPEX. Go back to the IRIS_Xcontrol window of the raster file. Select the Si IV 1403 and Mg II k 2796 lines and press Generate level3 files. In the next dialog to not select anything and just press OK. We will use this level 3 file next with CRISPEX. Note that only one file will be created, as the time domain is missing. It will take a while to start as CRISPEX calculates mean spectra and scaling factors. If everything went well you can start exploring the data. The main window will look black. This is because CRISPEX takes the first wavelength of the first line, in this case a wavelength in the continuum region of the Si IV 1403 line. The intensity here is mostly noise, so it appears as black. You can see the spectral windows in the other two windows: detailed spectrum and Spectral phi-slice . Change the Main spectral position slider to around position 205. 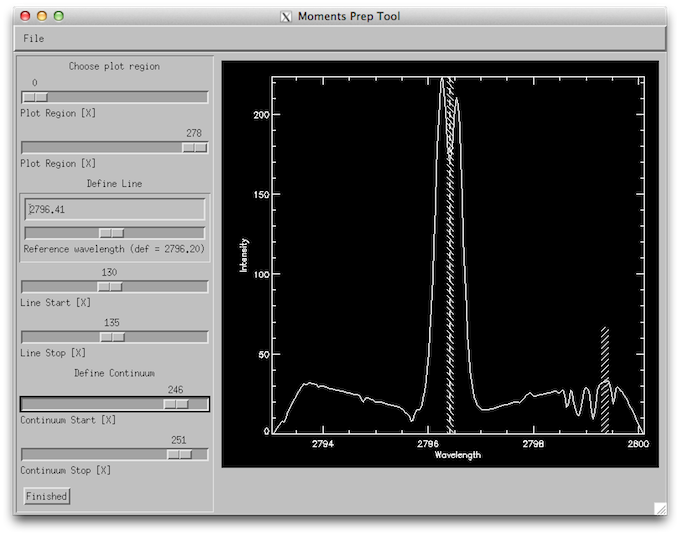 You can see on the spectra phi-slice that a vertical gray line moves. This indicates the current position in the spectrogram. Now you see more structure in the main image, but it is still a little dark. You can change the scaling in the Scaling tab: set the Histogram optimisation to 0.01 (this means that the scaling will be set from the 1% to 99% percentiles), or change the gamma to a lower value. 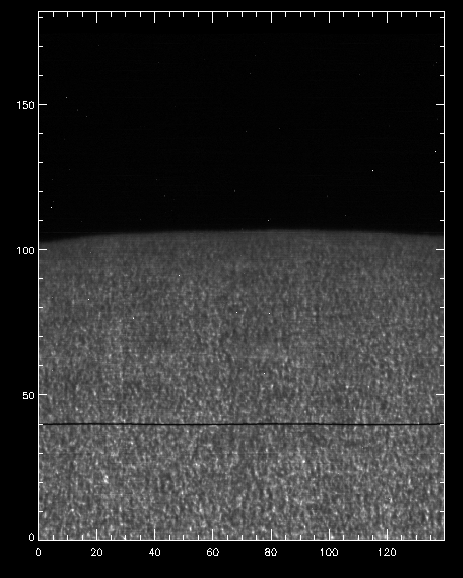 On the Detailed spectrum window you still see only a vague outline of spectral lines. You can change this scaling in the Displays tab: set Lower y-value to -0.01 and the Upper y-value to 0.1. Now you should see the Mg II k line well, but the Si IV line is only visible for the brightest points. When you move the mouse the windows update with the spectrum at the mouse pointer location. 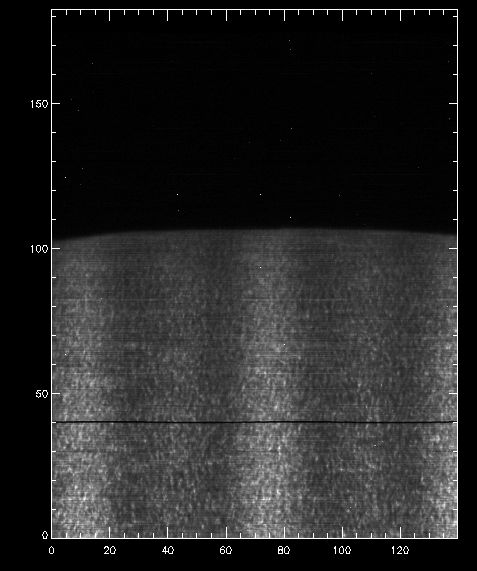 The Spectral phi-slice window shows a spectrogram with y being the position along a slit (the vertical white line that moves with the mouse cursor). If you click with the left button on a point it locks it. To unlock it you need to select the option Unlock from position on the middle of the main panel. 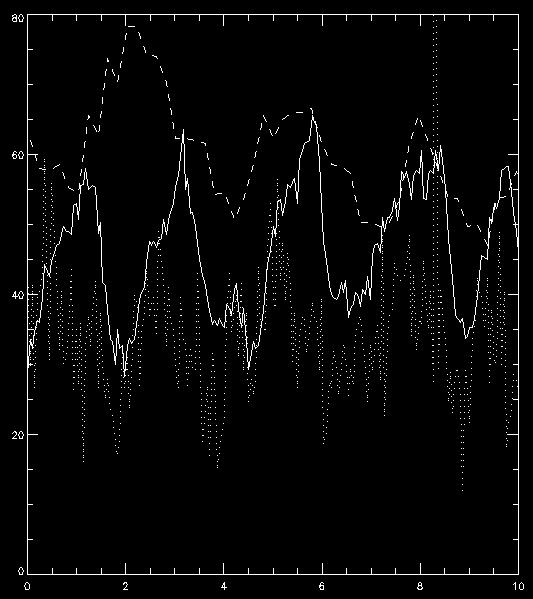 Below it you can also see some properties of the current position: coordinates, wavelength being show, time, data values, etc. You can change the parameters of the slit made to construct the Spectral phi-slice window. On the Spectral tab, middle part, there are controls named Slit controls. There you can adjust the angle and length of the slit, and see how the window changes. In this tutorial we are going to produce a Dopplergram for the Mg II k line from an IRIS 400-step raster. The Dopplergram is obtained by subtracting the intensities at symmetrical velocity shifts from the line core (e.g. ±50 km/s). 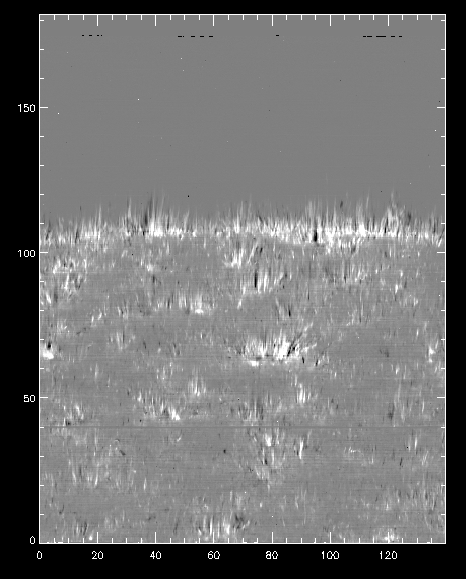 For this kind of analysis we need a consistent wavelength calibration for each step of the raster. Feel free to examine these data in iris_xfiles. 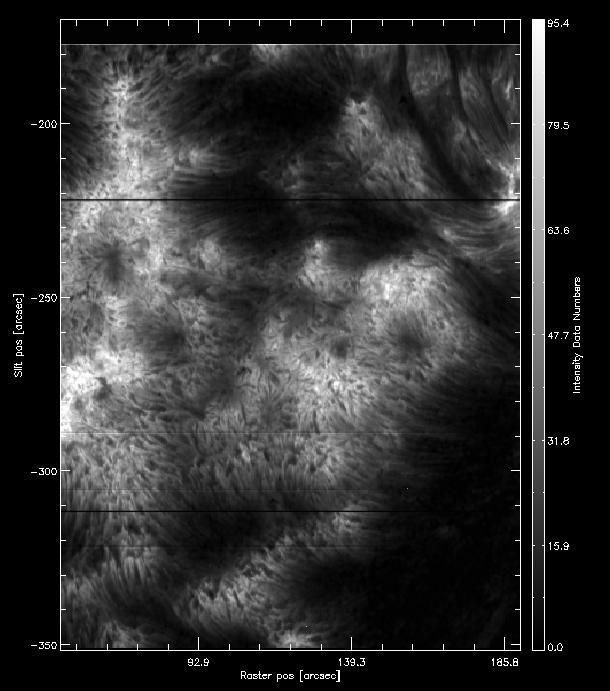 This very large dense raster took more than three hours to complete the 400 scans (30 s exposures), which means that the orbital velocity and thermal drifts were changed during the observations. This means that any precise wavelength calibration will need to correct for those shifts. Intensity at Mn I 280.2 nm line line when orbital velocity and thermal drifts are not accounted for. You can see a regular bright-dark pattern along the x axis, and indication that its intensities are not taken at the same position in the line because of wavelength shifts. A vector of level 2 fits raster files can also be passed to iris_prep_wavecorr_l2 instead of a single file; this example uses a single raster, so it has a single file, and as a result the leading dimension is 1 for the corrs, chisq, times and tais fields in the wavecorr structure. Fit to the orbital velocity/thermal shifts from iris_prep_wavecorr_l2. The smoothing of the wavelength variation assumes the IRIS orbital period. Shorter-timescale variations are sometimes evident; you can apply the shift of the individual measurements, or apply your own smoothing to the per-image measurements rather than using the smoothed corr_nuv and corr_fuv arrays if necessary. Intensity at Mn I 280.2 nm line when orbital velocity and thermal drifts are accounted for. Dopplergram for Mg II k at +/- 50 km/s. In this tutorial we will measure the intensities and velocity shifts of the Mg II k3 and k2 features. We will make use of the iris_get_mg_features_lev2 procedure, which is included in the IRIS SSW package. Intensity for the k3 peak from iris_get_mg_features. Velocity shifts for the k3 peak from iris_get_mg_features. As you can see, the code is not perfect at finding the positions of the spectral features in all pixels (see obvious black and white isolated pixels). Instead, it provides a reasonable estimate when the line profiles are well behaved , and a starting point to further analysis. In this tutorial we are going to work with spectra and slit-jaw images to study dynamical phenomena. The subject of this example is umbral flashes. The result can be seen below, with the x axis in minutes and the y axis in arcsec. Space-time diagram of the intensity at around the Mg II k3 core. 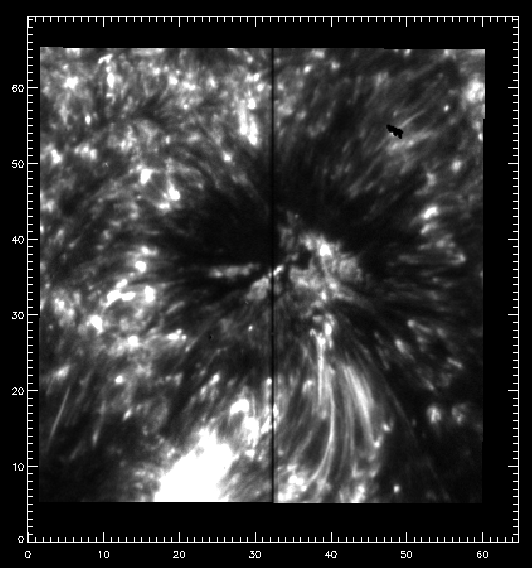 First SJI 1400 image of the observing sequence. The resulting plot can be found below. You are now ready to explore all the correlations, anti-correlations, and phase differences. 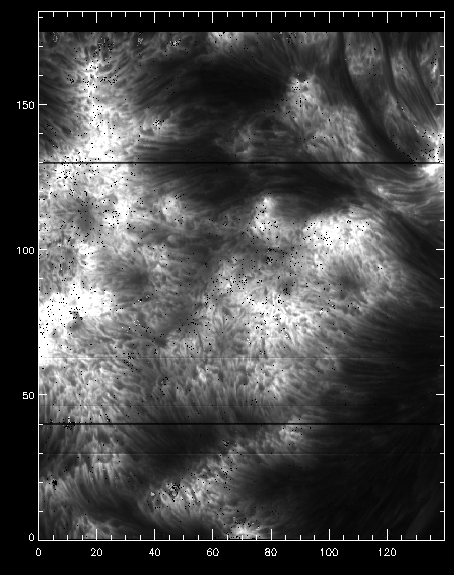 Intensity vs. time in minutes for an umbral flash oscilation, for Mg II k3 (solid), C II 1335 core (dotted) and 1400 slit-jaw (dashed).